Google has been working on a high altitude aircraft powered by solar power, which will be capable of flying for months. The plane can be used for various purposes; for example, providing internet access to remote locations. These planes will operate in unique environment for extended periods of time. So, they will need robust solar cells for continued operation over long durations. The patent discloses a method of making a solar cell assembly which includes placing backsides of multiple solar cells in contact with a substrate. 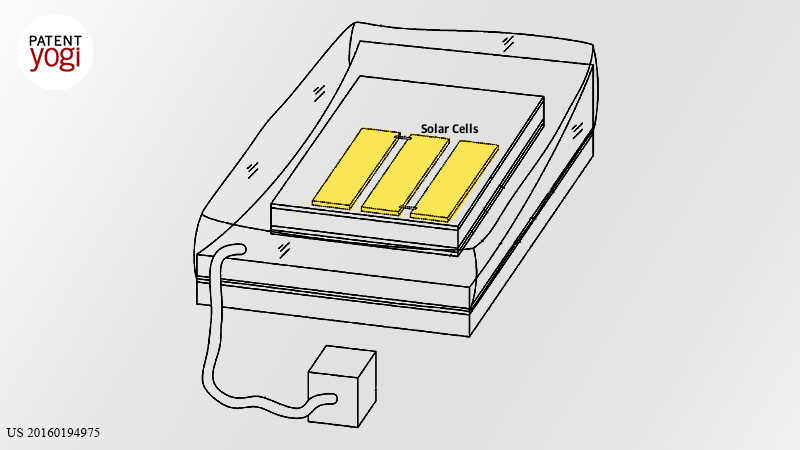 The solar cells are electrically connected to each other. Heat and pressure are applied to the solar cells and the substrate to simultaneously impress the solar cells into the substrate and bond the solar cells to the substrate. The solar cells are then covered with protective covers. Further, a vacuum bag is placed on the assembly. The overall strength of the solar cell assembly will be able to carry loads that would normally be carried by the aircraft structure. For example, when the solar cell assembly forms part of a wing upper surface, the upper surface can be placed in compression as the wing bends upwardly. Because the solar cells are intimately integrated with the assembly , they can carry the compression loads. Solar cells that are merely surface mounted on a wing (as is the case with some conventional arrangements) cannot suitably carry such compression loads.